Etudes Psychologiques. Organe du mouvement Religieux Liberal et du Spiritualisme Moderne / Organe du Mouvement de la Libre Pensee et du Spiritualisme Moderne / Etudes sur l'Occulte et la Philosophie Bouddhique. Nantes, then Avignon-Monclat, then Villeneuve-les-Avignon, France. Language: French. 1/1, March 1882-August 20, 1886. This was a small, undistinguished liberal and freethought spiritist journal. It was begun by "Emile Verdad" (Jules-Jacques Lessard), a longtime collaborator of Charles Fauvety and a friend of Eliphas Levi, who used the journal to espouse a combination of spiritualism and millennialist-socialist "Religion Laique." When poverty forced Verdad to abandon the cause in February 1884, Rene Caille (1811-1896),a retired engineer who began a little later to call himself “Caillie," assumed the editorship. He had collaborated in the journal from the beginning and was a devoted Kardecist spiritist and also a member of the earliest manifestation of the Theosophical Society in France, the Societe Theosophique des Spirites de France organized around H.P. Blavatsky's old friend P.-G. Leymarie, editor of the Revue Spirite. The journal would soon have passed into oblivion had not the socialist Louis Dramard, a former Communard exile and a founder of the Revue Socialiste, advanced the money to change the journal's focus to Theosophy. Dramard also was a Theosophist, having joined Societe Theosophique d'Orient et d'Occident of Marie, Countess of Caithness and Dutchess of Pomar in 1883. The transformation of the journal was occasioned by the fact that in 1884, the T.S. canceled Leymarie's group and the Countess of Caithness resigned from the society in a huff (though continuing her own organization), leaving the T.S. without a presence in French periodicals. 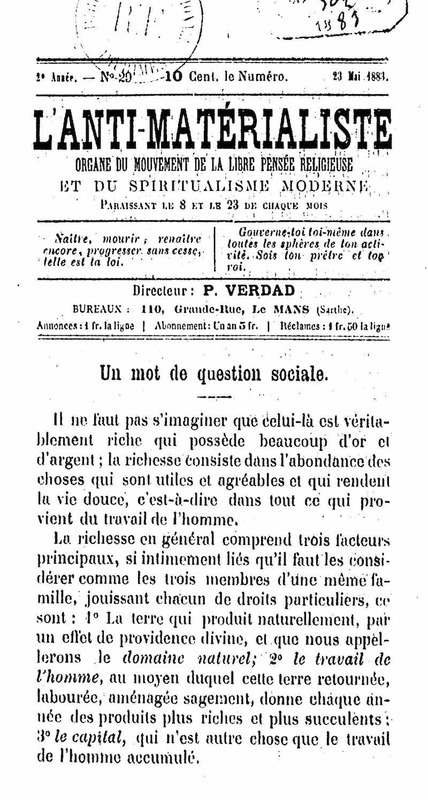 Dramard, whose main interest was in the society's idea of a universal brotherhood of men, tried to remedy the situation, and in September 1886 he paid to have Caillie and L'Anti-Materialiste publish “Theosophical" articles and change its name to Revue des Hautes-Etudes This, in turn, came to naught when the magazine was inundated with submissions (by the Abbe Paul Roca and Stanislas de Guaita, among others) attacking Theosophy, India and its mysteries, and the Mahatmas. The process revealed a fundamental division of thought in France that was to have immense consequences for occultism in the coming years. Dramard withdrew his support from Revue des Hautes-Etudes, which soon expired, and he and Theosophy channeled their energies into the Isis branch of the T.S. and its new journal Le Lotus, the nucleus from which the French occult revival of the 1890s grew. On all this, see the illuminating essay by Joscelyn Godwin, “The Beginnings of Theosophy in France," London: Theosophical History Center, 1989. The journal also published the first works of “F. Ch. Barlet" (Albert Faucheux, 1838-1909). BNF.